The new mod settings format allow to choose a specific ui control (slider, checkbox etc.) for specific settings, instead of a raw string box for all. This change was introduced months ago when LypyL wasn't around, so documentation was updated only on website. Legacy support for ini file was kept for 0.5 branch, and removed in 0.6 a month ago. Builds based on this branch are now being pushed, so this change has become effective. As you can see "CalculateHitPointsPerLevelUp" now always returns non-random HP which are simply depend on your END and HP per level. 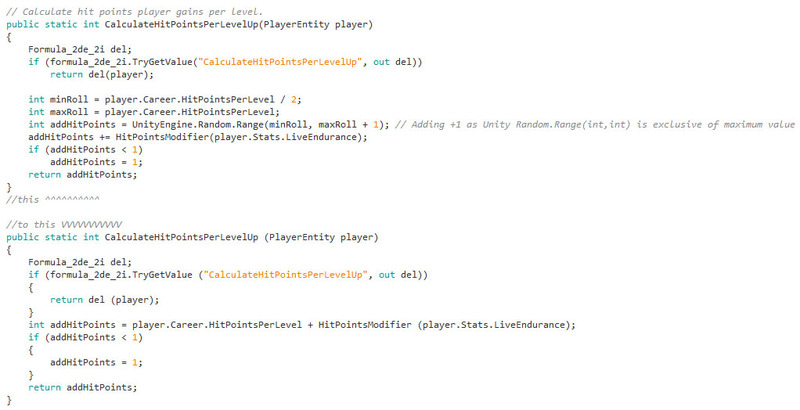 As I understand, currently mod files are simply loaded at the very beginning of the game and do something to the game, so what do I need to do intercept real "CalculateHitPointsPerLevelUp" with my "CalculateHitPointsPerLevelUp"? I need to create separate .cs file and somehow make it trigger whenever "CalculateHitPointsPerLevelUp" is triggered? So it's impossible for now to override formulas? Is it what I think? It first checks for something else (override?) and if exists, then it uses the modded formula, else it goes default one? If I sound rude, please ignore it, that's how I communicate. I'm actually very non-emotional and thus the chances that I'm angry while posting are ~0%. I also use sarcasm very often. This is where the method seek a callback to override default implementation. If you want to provide one, you need to push it to the dictionary formula_2de_2i. Yes, at first I thought it's some kind of debug/test stuff, then I realized that it's actually what I need. Ok, so I managed to make a mod and after testing it even works! This makes you always get max HP on each level up. 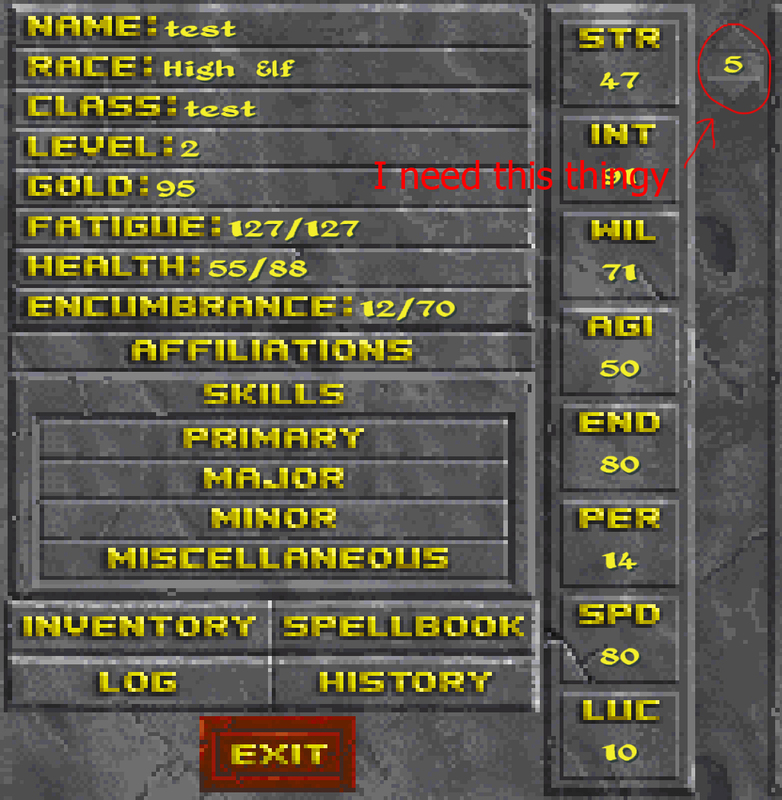 I still need to find where "attributes per level up" is and then I'll be able to make StaticLeveling mod, that makes level non-random, the problem, that I can't find it anywhere, I searched for "level", "attribute", "Random.Range", but couldn't find anything related to it. Also where can I find custom class advantages/disadvantages point costs? I want to make a rebalance mod that makes you unable to create imba OP builds. Oh wow, UserOfThisSite, so glad to see someone skilled and willing to implement these improvements I've been hoping for for a very long time! As one player who will always be using this mod (static leveling to "fix" Endurance and remove the annoying randomized stat/health points on level up) after you're able to complete it - thank you! Thank you, unfortunately, those aren't public and there're no public methods that can be overriden or that modify those values, as the result I see no way to change those values. Endurance now retroactive stat at last! Now, whenever you level up, the game checks how much HP you have, then it checks how much HP you must have according to formula 25 + MaxHPperLVL + (YourLvl-1) * (MaxHPperLVL + ENDmod), then it adds N hp to you, where N is the difference. On this image you can see that my character has 157 HP, I got 80 END on 1st level, then 86 END, then 91 END, custom class has 30 HP per level. At first I got +33 HP, then +33 HP, then +36 HP. +1 for additional END mod on this level and +2 from previous levels. Unfortunately you still need to wait for the next level for new END to apply. For example, when on 3rd level I still got 86 END, I received +33 HP and increased END to 91, but I still had the same HP, only on the next level the game calculated the real HP. Put it into "Daggerfall\DaggerfallUnity_Data\StreamingAssets\Mods" folder. The mod still doesn't change attributes per level and it's still random 4-6, unfortunately I can't change it due to its protection. Mod script simply can't access it. Thanks, I'll try it out when I can! Darn, that's really too bad. I guess nobody knows a way around this? Was hoping things like this would be fully moddable. It's very easy, someone simply need to change those values to public, it's few seconds work. 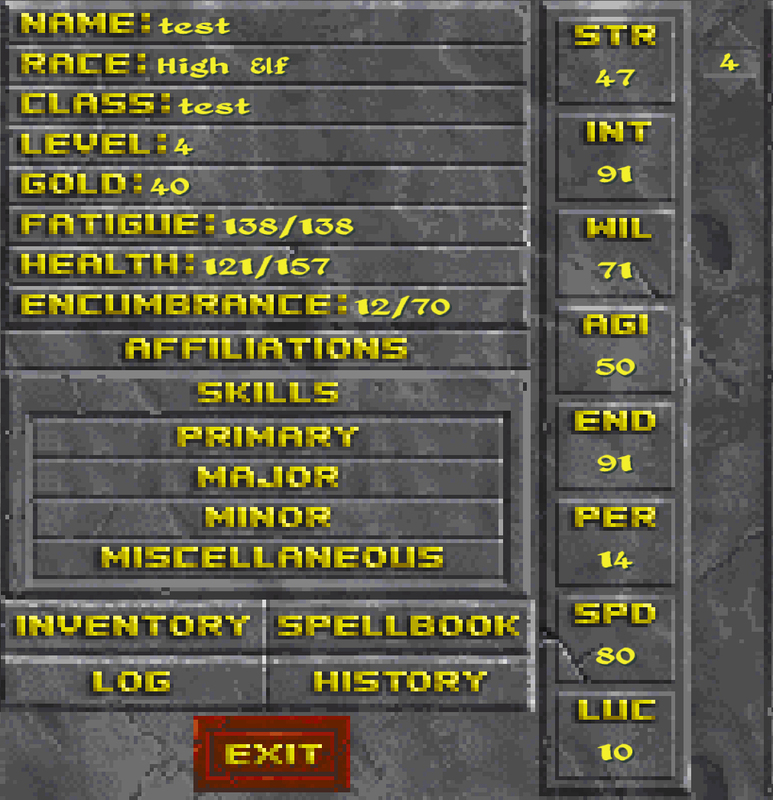 For example I can do that for my own Daggerfall, but then it won't be a mod any longer, but a hack. If DFU devs change those values to public on some newer version, then I'll update my mod. Oh, and forgot to add, this will work for existing game with no problem, you'll immediately get all the HP you lack on level up.